9.40pm GMT: A momentous day, with the election of the first Jesuit as pope, the first Latin American pope, the first pope from the southern hemisphere and the first non-European for 1,200 years, the first chemist pope and the first Pope Francis. We’ll be back tomorrow morning – in the meantime, to our readers across the world, God Bless. 9.37pm GMT: The Vatican’s semi-official newspaper L’Osservatore Romano has a new front page. 9.33pm GMT: American vice-president Joe Biden will lead an American deligation to Pope Francis’ installation in Rome next Tuesday. As he showed in his first address this evening, he is a man of great humility, asking first for the blessing of the crowd in St Peter’s Square before he delivered his own. His choice of the name “Francis” evokes St Francis of Assisi, the Italian mystic who received a call from God to “rebuild my Church”. Pope Francis must believe that it is his task to rebuild a Church that has been profoundly damaged by abuse scandals and corruption within the Roman Curia. The Archbishop of Canterbury Justin Welby offered his congratulations, saying the election of the new Pope was of great significance to all Christians. “We have long since recognised – and often reaffirmed – that our churches hold a special place for one another. I look forward to meeting Pope Francis, and to walking and working together to build on the consistent legacy of our predecessors,” he says. Barack Obama, said: “On behalf of the American people, Michelle and I offer our warm wishes to His Holiness Pope Francis as he ascends to the chair of St Peter and begins his papacy. “As a champion of the poor and the most vulnerable among us, he carries forth the message of love and compassion that has inspired the world for more than 2,000 years that in each other we see the face of God. The European Union leaders Herman Van Rompuy and Jose Manuel Barroso wished the new Catholic leader “a long and blessed pontificate”. 8.56pm GMT: NCR reports: Pope Francis’ installation Mass will take place at 9:30 a.m. Rome time Tuesday, March 19, at the Vatican. 8.53pm GMT: The Washington Post lists the 10 previous non-European popes, starting with St Peter and ending with Gregory III. 8.52pm GMT: Fr Lombardi says Pope Francis has telephoned the Pope Emeritus. * Aged 76, he was born in Buenos Aires on December 17, 1936, one of five children of an Italian immigrant railway worker. * He entered the Society of Jesus in 1958. He was the provincial for Argentina from 1973 to 1979. * He was ordained a priest in 1969 and a bishop in 1992, and was made a cardinal in 2001. * He is the first Jesuit ever to be pope. * He is the first non-European pope since Pope Gregory III (AD 731-741). * He is the first pope from the Americas, and the first pope from the southern hemisphere. * He is the first pope to introduce a new single papal name in over 1,000 years. * He is seen as a link between the Jesuits and the Communion and Liberation movement. * In 2001 he visited a hospice to kiss and wash the feet of 12 AIDS patients. * In September 2012 he criticised priests who refuse to baptise children born out of wedlock, calling it a form of “rigorous and hypocritical neo-clericalism”. “I was surprised that the conclave was so quick. It took hardly any longer than the election of Benedict XVI. Given the pre-Conclave situation, and the absence of a single dominant figure, I can only see this quick result as God’s work. As soon as I heard I went into my chapel and offered a grateful and joyful prayer of thanksgiving … Deo Gratias! “He is a man of firsts. The first Latin Anerican. The first Jesuit. The first Pope Francis. I think we can take from his first appearance that he is a humble, spiritual and calm man. A reconciler and healer, with a strong background on social justice. His name reminds us of the little saint of Assisi. A simple man who was the poor servant of Jesus and who was given the message ‘rebuild my church’. It is a very significant message for our time. He may also have in mind St Francis Xavier the great missionary and a reminder of the need for a new evangelisation. 8.16pm GMT: He is a fan of San Lorenzo del Almagro football club and was given a signed shirt by the team. The club were founded by Fr Lorenzo Massa, who offered local street children a place to play football after he saw a tram almost run over some children playing the game. He is a passionate reader of Borges and Dostoyevsky. After the dust settled from the election of Benedict XVI, various reports identified the Argentine Jesuit as the main challenger to then-Cardinal Joseph Ratzinger. One cardinal later said the conclave had been “something of a horse race” between Ratzinger and Bergoglio, and an anonymous conclave diary splashed across the Italian media in September 2005 claimed that Bergoglio received 40 votes on the third ballot, just before Ratzinger crossed the two-thirds threshold and became pope. commitment to the developing world. Back in 2005, Bergoglio drew high marks as an accomplished intellectual, having studied theology in Germany. His leading role during the Argentine economic crisis burnished his reputation as a voice of conscience, and made him a potent symbol of the costs globalization can impose on the world’s poor. 8.06pm GMT: Prime Minister David Cameron welcomes the new pope, calling it a “momentous day” for Catholics around the world. 8.02pm GMT: The last non-European pope was Gregory III, a Syrian, who died in 741. 7.57pm GMT: Ged Clapson, the communications officer of the British Jesuit, says: “I am completely surprised and delighted. He has chosen a very appropriate name because to combine Assisi with Xavier one has peace and evangelisation. A very thoughtful choice of name. “On behalf of all the clergy and laity of the Diocese of Portsmouth, I am absolutely delighted to welcome our new Holy Father, Pope Francis l.
“We are profoundly grateful to God for the gift of this great and holy man to the Church to lead us as 265th Successor of St. Peter. We pray for him and express to him our deep loyalty and fidelity. “May the Holy Spirit inspire him with all the spiritual gifts needed for the work of new evangelisation, and grant him the personal health and strength for the challenges ahead. 7.48pm GMT: We have a profile of the new pope. 7pm GMT: The @pontifex Twitter account has been reactivated. 6.47pm GMT: Before he comes out on the balcony, the new pope will pause in the Pauline chapel of the Apostolic Palace for a moment of adoration. 6.40pm GMT: All of Italy’s military bands are marching in formation. 6.38pm GMT: Protodeacon Cardinal Tauran will shortly appear on the balcony to announce the new pope. 6.34pm GMT Fr Thomas Rosica of the Vatican press office says Salt + Light Television that “things were much more open this year… they were keenly aware what kind of leader was necessary”. 6.27pm GMT: Flags of Poland, France, Spain, USA, Argentina, Romania, Mexico, Malta and Brazil in St Peter’s Square. 6.24pm GNT: Catholic News Service report that it will be up another 40 minutes until Cardinal Tauran appears to tell us who is pope. 6.22pm GMT: The bells of Liverpool Metropolitan Cathedral are ringing to celebrate the election, reports Huw Twiston-Davies. 6.17pm GMT: Catholic News Service reports: ‘Thousands running toward St. Pete’s Square to join those already there’. 6.15pm GMT: What happens now: the elected cardinal is asked if he accepts his election as pope. If he accepts, he choses the name he will take. He then goes to the Room of Tears, where he dresses in a white cassock. He returns to the cardinals, who will kiss his ring in humility and obeisance. From the central balcony of St Peter’s Basilica, the senior cardinal deacon proclaims “Habemus papam!” – we have a pope! and announces his name, first as cardnal and then his papal name. The new pontiff appears on the balcony and gives his first papal blessing. 6.10pm GMT: The crowd are cheering Habemus Papam! We shall know his name between 6.40 and 6.55pm. 17.23 GMT: Here is some conclave trivia to pass the time. Did you know Gregory X’s approach was to make conditions so spartan that the cardinals were pressured into making a decision fast? “When Pope Benedict XVI stepped out onto the balcony in 2005, photographers caught images of a plain black sweater under his new papal vestments. (As a footnote, the sleeves of the sweater were later airbrushed out of official Vatican portraits of the moment.) The new pope declared himself “a simple and humble worker in the vineyard of the lord.” Both the sweater and the words were hints that Benedict didn’t have an overly grandiose notion of his own role, an outlook that culminated eight years later in his resignation. “If the new pope holds to form, he’ll ask the cardinals who elected him to stay an extra night in the Casa Santa Marta, the hotel on Vatican grounds where they’re lodged during the conclave, and then join him the next morning for Mass in the Sistine Chapel. 16.28 GMT: Fr James Martin suggests a prayer while we wait. 3) Remember that the story doesn¹t end with the new Pope¹s appearance. 15.49 GMT: The 115 cardinals are due to begin two rounds of voting for a new pope now. 15.30 GMT: Full text of Fr Thomas Rosica describing how he felt when he discovered he would be entering the Sistine Chapel with the cardinals on Tuesday. 15.22 GMT: Cardinals are now making their way to the Apostolic Palace. At 15.50 GMT they will begin two more rounds of voting. “The BBC, typically, is also already using the word ‘deadlock’ to describe the Conclave – even though a resolution this morning would have made it a very fast election. But the idea of division and antipathy within the Vatican suits the secular line on Catholicism, so we can expect much more media talk of ‘deadlock’, ‘impasse’ and ‘crisis’ as long as the election carries on. The Cardinals will know that, even if they can’t see it. “At the same time, there is an extent to which the experts are modelling their theories on what happened in 2005. The dynamics of this Conclave are very different. Eight years ago, Joseph Ratzinger was the obvious quick choice. His opponents in the College of Cardinals pushed, it is said, for the Argentine Cardinal Jorge Bergoglio (who is in the Sistine Chapel again this week) but they fell short. Ratzinger had too much support within and without the Curia. Scola does not have quite the same sway. “It’s all too contradictory for confident assertions. It is said that the more curial-minded electors – many of whom are Italian — are keen for a world figure who will not interfere with their control of the Vatican, while foreign Archbishops want a Roman figure to shake things up in and around St Peter’s. 14.40 GMT: Belfast Telegraph summarises the length of the papal conclaves of the last 100 years. “John XXIII was expected to be a caretaker pope, after the 19-year pontificate of Pius XII, but the Vatican Council he set in motion had a huge impact. What people remember about him most is his humanity – his smile especially. “Good Pope John”, some called him. He was a member of the human race. He had sort of holy simplicity. Pope Benedict had this quality, too, even though he was a brilliant scholar. You saw this when he addressed the schoolchildren in Twickenham in 2010. He told them that they could be the saints of the 21st century. One of the tragedies of the modern world, he said, was that young people don’t find happiness, because they look for it in the wrong places. “The key to it is very simple – true happiness is to be found in God. 12.48pm GMT: Among other things, Fr Lombardi shows what the ballot paper looks like. 12.23pm GTM: The press conference has been discussing the chemicals involved in the conclave smoke. A post on the St Michael Society blog explains the historical background of the smoke. 12.17pm GMT: Barack Obama says an American pope could preside just as effectively as a Polish or Guatemalan one. 12.12pm GMT: At a press conference Fr Federico Lombardi says that he was surprised by how many people turned up in St Peter’s Sequare. He said there had been three ballots without anyone getting 77 votes, a “normal process of discernment”. 12.04pm GMT: Cardinal Schoenborn’s 92-year-old mother Eleonore hope he does not get made pope, the Huffington Post reports. 12.03pm GMT: The Washington Post has run two profiles on Cardinal Angelo Scola and Cardinal Marc Ouellet. 12.00pm GMT: For those who wish to know, the Catholic Truth Society’s Conclave: Step by Step through the Papal Interregnum explains everything. 11.33am GMT: The Times of India has a feature on Moran Mor Baselios Cardinal Cleemis Catholicos, the youngest cardinal elector. 11.02am GMT: The Catholic News Service has compiled an invaluable list of the cardinal electors’ first names in Latin, in the accusative case. When this name is read out on the balcony of St Peter’s it will be the first clue to the identity of the new pope. 10.42am GMT: Rome does not look especially inviting (even watching from Britain), but the papal conclave will still benefit the city’s tourism industry, reports Business Week. 10.39am GMT: Two more rounds of voting will begin at 3.50pm. 10.35am GMT: Spotify has come up with a list of songs for the conclave: The list was created by Notre Dame Center for Liturgy’s director Tim O’Malley and assistant director Carolyn Pirtle. 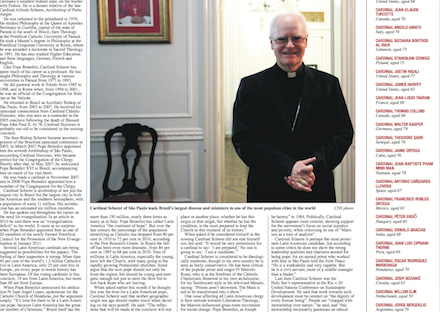 10.27am GMT: If elected, would Cardinal Dolan take the name Hilarius II, asks David Gibson. 9.46pm GMT: Catholic Herald blogger Francis Phillips writes about the sadness and sacrifice that comes with being pope. 9.21pm GMT: The Cardinals are in their second ballot. None of the previous five popes have been elected within the first three ballots, although John Paul I and Benedict XVI were elected on the fourth. Those four rounds of voting loom as the make-or-break test for whoever emerged yesterday as the early frontrunner, or frontrunners. If one candidate continues to gain momentum and appears to be headed to 77 votes, it could be the “knock-out blow” that Super Tuesday is designed to deliver in American primaries, allowing one candidate to take control of the race and avoiding gridlock down the stretch. Just as in American politics, however, Super Tuesday doesn’t always work as advertised. Sometimes the results are mixed, and that’s when things can get interesting. In the second conclave of 1978, the New Hampshire phase in the early rounds of voting clearly identified two powerhouse candidates, Cardinals Giovanni Benelli and Giuseppe Siri. That conclave’s Super Tuesday, however, made it clear that neither man was going to cross the two-thirds threshold. At that stage the cardinals were forced to go looking for an alternative, and they found Karol Wojtyla of Krakow, who took the world by storm as Pope John Paul II. The bottom line is that if today fails to deliver a pope, then all bets are off in terms of who might step out on the balcony of St. Peter’s Basilica wearing white. 8.30am GMT: Welcome to our live blog on the second day of the conclave. The cardinals had breakfast in their residence from 5.30am GMT. At 6.45am GMT they transferred from the Domus Sanctae Marthae to the Pauline Chapel. At 7.15am GMT they began to celebrate Mass in the chapel. The cardinals are now moving from the Pauline Chapel to the Sistine Chapel, where they will pray the Liturgy of the Hours. Around 9.00am GMT the cardinals will proceed with two rounds of voting. At 11am GMT the smoke is sent up after the morning votes. The cardinals will transfer from the Sistine Chapel to the Domus Sanctae Marthae at 11.30pm GMT At noon, lunch is served. At 3pm GMT the cardinals transfer from the Domus Sanctae Marthae to the Sistine Chapel. At 3:50pm GMT, after a brief prayer the cardinals proceed with the two rounds of evening votes. At 6pm GMT the smoke is sent up after the evening votes.